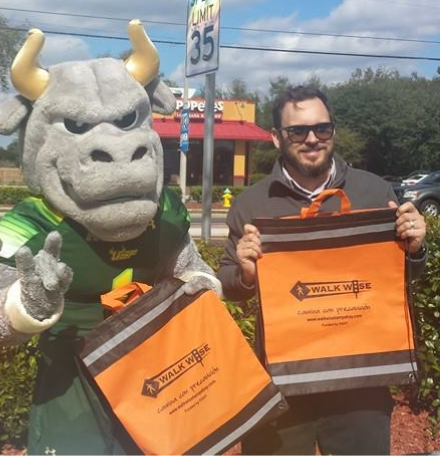 WalkWise is a grassroots initiative providing innovative pedestrian safety education to the citizens of Florida. Pedestrian safety is an issue that affects everyone. We are all pedestrians at some point during our day as we walk for any purpose. Whether walking through a parking lot after shopping, walking from home or work to a vehicle, walking for exercise or simply walking to enjoy a beautiful Florida day, you are a pedestrian. The WalkWise campaign provides an informative, free 30-minute presentation with time for discussion to anyone living or working in select Florida counties. WalkWise Florida is managed by the Center for Urban Transportation Research (CUTR) at USF and funded by the Florida Department of Transportation.